So it goes...: Game Day! It's Ben's first game as a 6th Grade Jr. Blackshirt today. It's a gorgeous 75 degree, low humidity, beginning-of-fall type day. 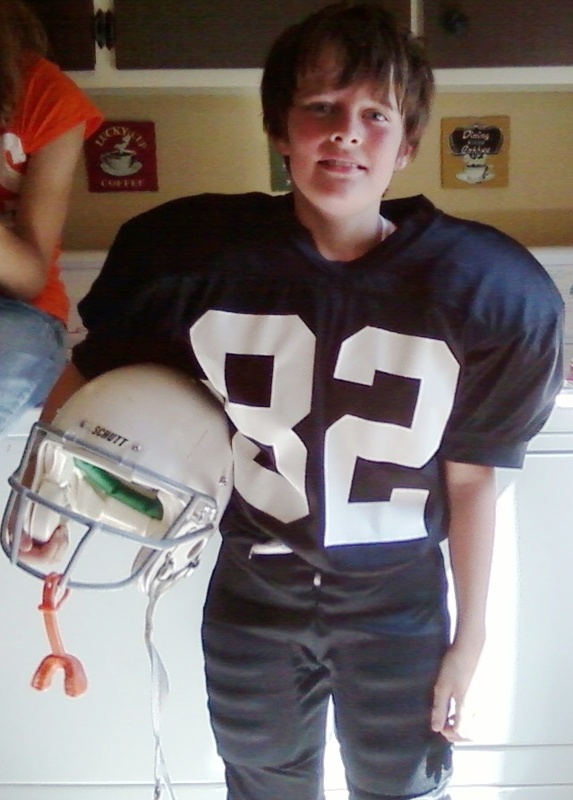 The whole Ben/Football experience brings me back to my days as a young player. I loved everything about it and am trying to instill that in Ben. He seems to be much better with it than he was during conditioning week, but the jury's still out on whether he'll take it to the long term. I think for him, more than the playing itself, he likes the comraderie and team concept more than the actual playing, but I might be wrong. I do know that for the first time in forever, he sat and watched part of the Packer game with me on Thursday. My experience as a player was much different than Ben's as I recall. It was no where near as organized or competitive. It was an intramural program run by Wally Wescott of St. Lukes. I remember him showing up at practice time in his beat up Ford convertible with a trunk full of helmets. I can't recall for sure or not, but I think we picked out a helmet every practice, and weren't allowed to take them home; but I might be wrong about that. I do know that I, and most the other kids, biked to practice and back and had none of the shuttle service going that Donna and I are part of today. Ben could probably bike it too, as it's not much more than a mile away, but we drive him nonetheless. We at least carpool with another family. I've got the Chain-Gang duty and Donna has concessions today. I told Ben I'd cheat a bit for his team and try and not stretch the chains when it was close to a first down for his team. (Kidding of course.) It should actually be one of the better ways to see the game up close and personal like. I've got to run to the game now, so I'll be blogging off...On to Victory!